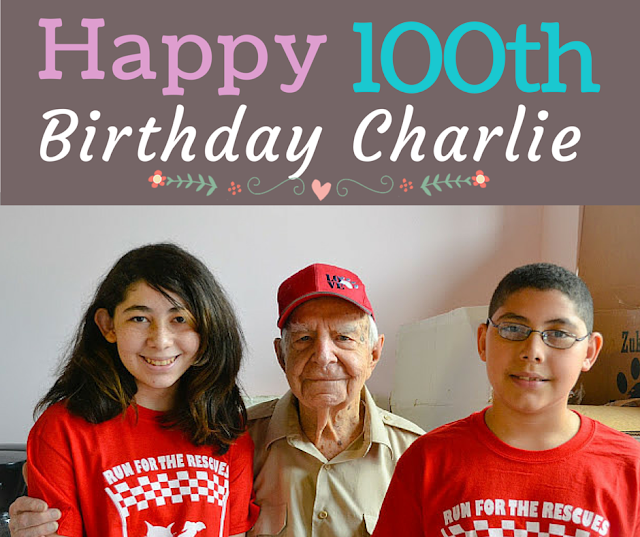 Suwanee, Ga (October 27, 2015) - The Georgia Society for the Prevention of Cruelty to Animals (Georgia SPCA) is excited to announce that one of its longtime volunteers, Charlie Yaeger, will be celebrating his 100th birthday at the upcoming pet adoption event held at PetSmart’s Lawrenceville location (875 Lawrenceville-Suwanee Road) on Sunday, November 1st from 11 am - 3pm. Charlie is a retired aircraft engine designer who has lived all over the United States before settling in the Atlanta area to be closer to his children after the passing of his wife, Madeline. Charlie and his family have been ardent supporters of the SPCA and animal welfare causes. He has always had pets, mostly dogs in his life, including a rescue, a black lab puppy who has gone down as the most memorable family pet. Charlie lives independently, still drives a car, and loves to participate in pet adoption events and other shelter activities where he feels he can be of any help. He attributes his longevity to a positive attitude, inquisitive mind, caring heart, and childlike soul. Oh - and a love of singing and dancing to Big Band music. The Georgia SPCA invites the community to come by the PetSmart at 875 Lawrenceville-Suwanee Road to wish Charlie a happy 100th birthday. While you are there, learn about the SPCA’s efforts, play with the adoptable pets, and have a piece of cake to celebrate. Charlie would be honored for you to drop something in the donation jar to help homeless pets, in celebration of his birthday.